Tin Can Daisy: Rainbow patch quilt - or Procrastination is stupid. 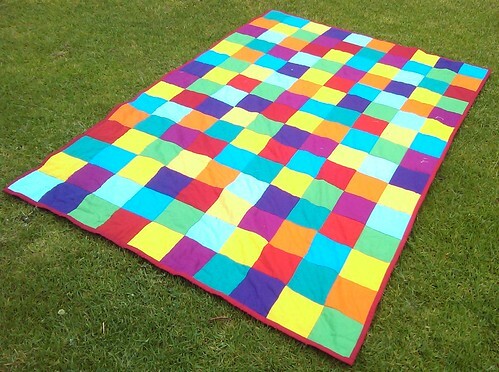 Rainbow patch quilt - or Procrastination is stupid. 2012-11-27 12.17.58, a photo by TinCanDaisy on Flickr. My daughter asked me to make her a quilt like the one in her favourite book - Laura's Star. That was 3 years ago and I procrastinated for that long. First I thought I needed exactly the same colours as the book, then I couldn't decide what backing to use then I couldn't decide what size to make it and then for some reason I couldn't find any enthusiasm for the project. I guess I had just put so many obstacles in my own path that it became too hard. One day though I just decided I was being ridiculous....my daughter really wanted the quilt. If I left it any longer she wouldn't be interested in it any more and it would just become another thing I'd promised to make her and never gotten to, so I just started on it and lo and behold it really wasn't that hard. So the moral of the story is, procrastinating that much is stupid. It really is. The quilt is single bed size, the quilting cottons came mostly from spotlight. I used a flannelette sheet to back it so it's nice and snuggly and the bamboo wadding came from my mother in laws stash, I had to piece it but that was no drama either. I'm so glad I made this for my girl, she loves it. She feels loved and I feel like a good mama for getting it done when I said I would. I agree to your post. Procrastination can cause delay in achieving goals, the key to fight it is to just start and have realistic goals.